A Tricolored (or Louisiana) Heron in breeding plumage shakes it all off, with the start of a new week, in undisguised fabulousness in our protected wetlands. While I say “Monday Morning Hair,” this is definitely a daily occurrence for me. When I saw the title, I was SURE this was about *human* blue hair!! <:-D The heron is lovely of course…. Bad hair day. Wonderful photo. Even their worst hair day is beautiful! …. Now there is an itch that has been THOROUGHLY scratched! Beautiful Captures – One Wild Hairdo:) Happy Monday! It’s a glorious ‘do — he’s fabulous and he knows it! Thanks so much! They’re so very lovely in their breeding colors, aren’t they? Very nice photos of a bird that I’ve never seen before, thank you! Ah yes, that’s wildly wonderful. Thanks so much! They’re beautiful birds, and I’m very fortunate to get as close as I can to them…. I giggle! What fun FeyGirl. I do too!! Their personalities, their colors (I love the blues….!). Fantastic shots of the wonderful Tri! …. Just a FYI, every time I try to Like or Comment on one of your posts, my browser blows up. Doesn’t happen anywhere else. Hm, so odd… I haven’t heard this before. I’ll definitely report it. What browser / etc are you using – I know they’ll ask! …. M’lady, I NEVER have trouble with your blog – just Phil’s. I use Chrome on an Win XP box. Every time I click [Like] or [Comment] on his posts, I get the “Aw, SNAP!” screen. Oops, I see that now… I commented on the wrong comment. So confusing. Sorry Phil! Good luck! O , the models you find!!!! Thank you. Wish we had herons like him or her here where i live . Love Love Love these ! He is such a character. Makes you want to go party with him. LOL! This is was a fun title for a comical but beautiful bird. Great shots. I love that bird! Thank you! I love these guys, too… They’re really quirky (and blue, love the blue!). Wow, that crest looks great spiked up like that! Isn’t he fabulous? I love our Tricoloreds!! Beautiful shots of a gorgeous bird! 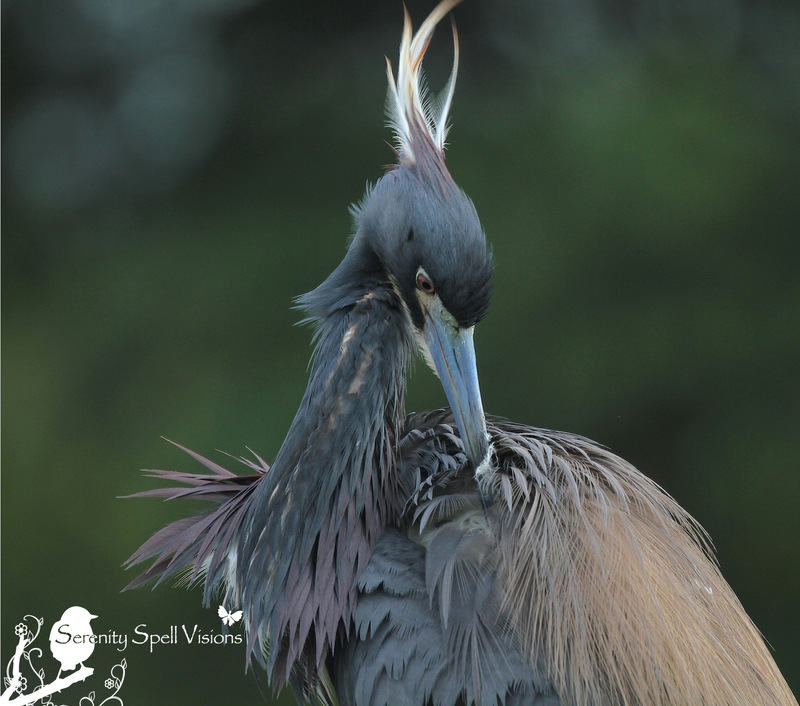 A little rattled, a little ruffled – completely beautiful! Those are some formidable talons – I do hope it was careful. 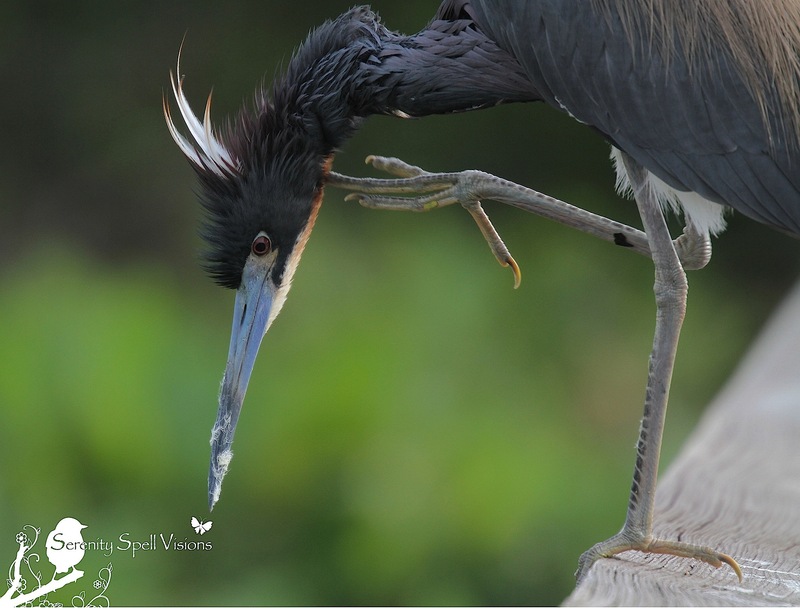 The wading birds have the fiercest talons and bills — it’s amazing to see them close-up. The look so very delicate and sweet, but underneath it all, they’re sublime hunters. What an incredibly kind and thoughtful thing to say…. AS ALWAYS you have such a beautiful way with words. And these made my week, my month! THANK YOU, for that! 🙂 I really do believe in the special uniqueness, the individuality of all life. ALL life, on this planet. Such nice photos of this very interesting bird. Absolutely beautiful bird and photos, Feygirl (and I’m smiling now 🙂 ). Hee!!! I’m glad it got a smile from you. 🙂 Thanks so much!!! Thanks so much — I love the personality of these guys… And their color. BLUE! The photos are quite outstanding. Thanks so very much! I’m lucky to be surrounded by some amazing creatures in these parts — especially when it comes to the breeding season. Beautiful photographs of a gorgeous bird. Thanks so much!! They’re such gorgeous animals — and during breeding season? Ah, the colors! The feathers! Thanks so very much!! 🙂 I love this guy. Your photos are great! Keep up the great work, it’s a very fine blog! Thanks so very much for your kind words…. I just adore your blog and its content, and am thrilled to have found you. Thank you! I loved this guy… He was a character.